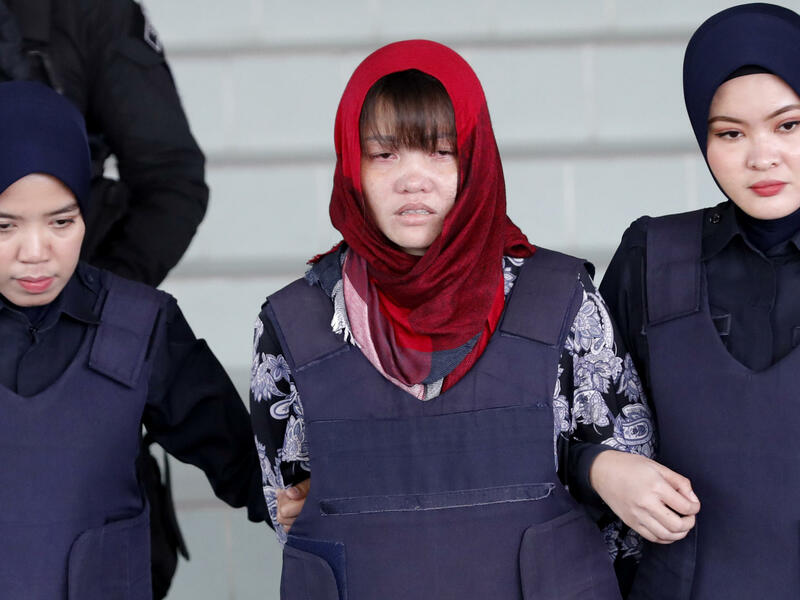 Vietnamese Doan Thi Huong, center, is escorted by police as she leaves Shah Alam High Court in Malaysia on Thursday. Malaysia's attorney general ordered the murder case to proceed against the Vietnamese woman accused in the killing of the North Korean leader's estranged half brother. Just as the defense phase of the trial was about to begin Monday, one of the women — an Indonesian named Siti Aisyah, 27 — was unexpectedly freed. The murder trial of the other woman — Doan Thi Huong, 30, of Vietnam — was put on hold. But now Malaysia's attorney general has ordered that her trial proceed. Prosecutors did not explain the decision. "God knows that Siti and I did nothing wrong," Huong told reporters in court through an interpreter, according to the Guardian. "Please call my father, call my family, and ask for them to pray for me." Huong's lawyer Hisyam Teh Poh Teik told the court the decision was "perverse," as her case was so similar to Aisyah's. "Very obviously, there is discrimination," he said, according to the Associated Press. "The AG favored one party to the other." Vietnamese Ambassador Le Quy Quynh said he was "disappointed," and that his country had been lobbying for Huong's release, and would continue to do so. The Indonesian government made it a point to push for Aisyah's release in every meeting between officials from the two countries, the AP has reported. Huong's trial was postponed until April 1 after Doan's lawyer said she needed medical treatment. The Guardian reported that Huong looked pale and drawn. Reluctantly agreeing to postpone the trial, the judge said: "I wish I could just carry on but the accused is clearly not mentally or physically fit to testify." Sobbing, Huong was handcuffed to be taken back to jail, the Guardian said. She could be seen shaking as she pleaded with Vietnam embassy officials.